On September 10, we provided a one-day Introduction to GoldSim Course that was attended by over 30 people. This provided a "crash course" in GoldSim, and although aimed primarily at novice users, was also attended by some of our more experienced users. Day two of the conference focused on advanced training topics. The day featured ten sessions, split into two parallel tracks. Topics ranged from model calibration to advanced time stepping techniques to reliability modeling. That evening, the entire group traveled to Safeco Field to watch the Seattle Mariners take on the San Diego Padres. We had a large luxury suite from which to take in the sights and sounds of the ballpark and enjoy some food and drink. Unfortunately, our Mariners lost, but an excellent time was certainly had by all. 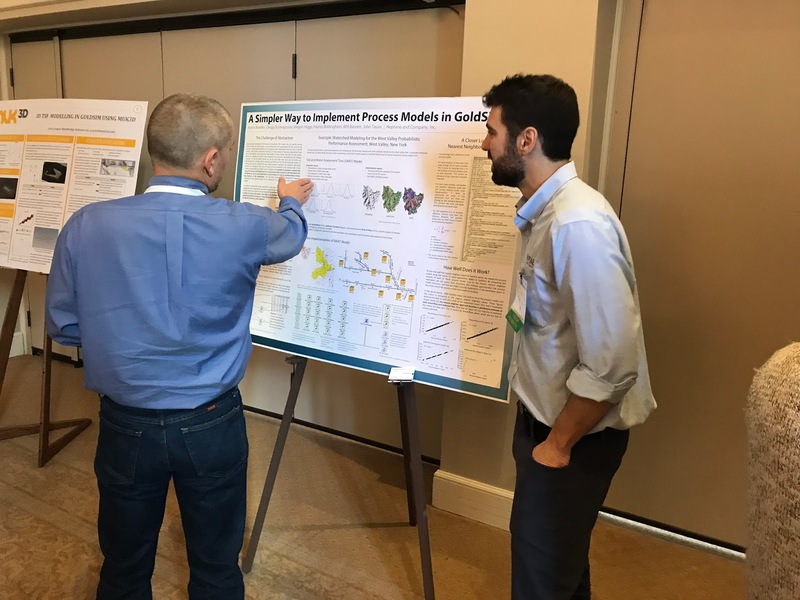 The final day of the conference featured five invited papers describing interesting GoldSim applications and modeling advice from some of the most experienced GoldSim modelers. The abstracts and shorts bios of the invited speakers can be viewed here. The full presentations can be downloaded here. In addition to the invited papers, we held an interesting panel discussion on the "Best Practices for Building, Maintaining and Reusing GoldSim Model Components". This panel featured four more experienced GoldSim modelers (you can read their bios here). This discussion addressed how organizations can most efficiently leverage their resources so as to build, maintain and reuse models. It was a lively discussion with lots of excellent ideas ranging from maintaining internal model libraries to developing "style guides" for model development. Another highlight of the final day of the conference was the poster session, which is always one of the most popular portions of the user conference. This provides an opportunity for attendees to describe (in detail) interesting GoldSim applications and/or modeling approaches. Abstracts of the posters can be found here. The actual posters can be downloaded here. All attendees voted for the Best Poster, which was won by Aaron Bandler (and colleagues) from Neptune and Company for "A Simpler Way to Implement a Process Model in GoldSim". We handed Aaron a $500 Amazon gift certificate for his efforts (it is not clear if he shared this with the four other authors of the poster 😀). It was a fun conference and we thoroughly enjoyed meeting and socializing with the attendees. Let's do it all over again in another year or so!